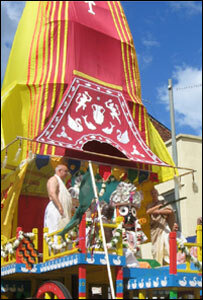 The colourful event has been described by the head of the Hare Krishna Movement in the UK as "an amazing east-meets-west experience." Praghosa Das added: "The traditional Indian singing, dancing and free vegetarian food and the sheer exotic pageantry make it a fun day out for all the family." The festival was first seen outside India in San Francisco in 1967. It has been held annually in London since 1969, but this is said to be the first time the festival had come to Wales.